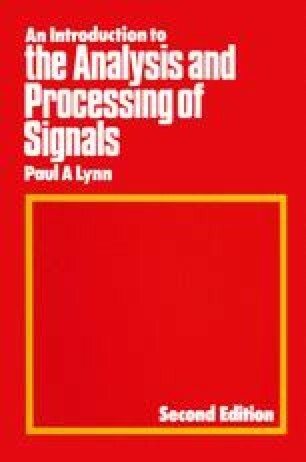 Linear filters form a class of system which is of crucial importance in signal processing. Although in its most general sense the term ‘filter’ implies any frequency-selective device or processor, in practice it is generally reserved for a system which transmits a certain range (or ranges) of frequencies, and rejects others: such frequency ranges are called ‘passbands’ and ‘stopbands’ respectively. We shall see later that the ideal filter, which would introduce no attenuation of input signals falling within the passband, and infinite attenuation of signals in the stopband, is not attainable in practice.